I’ve only been working with Informed Infrastructure and Vector1 Media for a short while, but I’ve been in the geospatial technology industry for 17 years. So it’s a bit surprising that I’ve never been to an Autodesk University event. 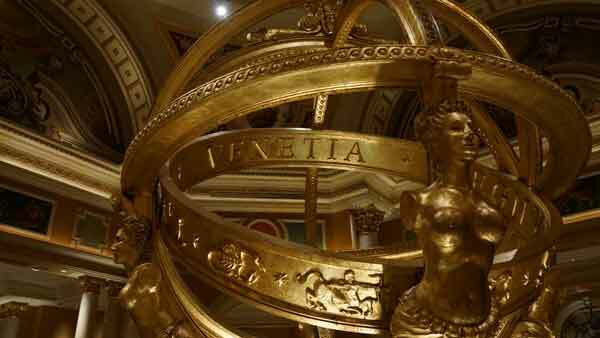 And although I’ve been to Las Vegas many times in my travels, this was my first stay at The Venetian hotel and casino, which hosted the event. With beautiful paintings and artwork throughout, The Venetian makes for a lovely conference host. 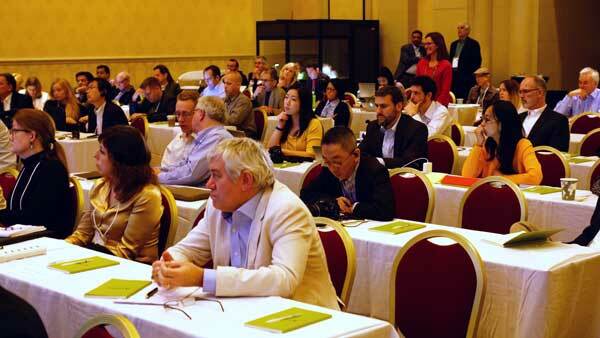 Three days later, with my first show behind me, this article recaps the conference, starting after Matt Ball’s extensive coverage of the Autodesk Infrastructure Symposium on Dec. 2, 2013. The opening keynote began with a brief illusion from the world-famous act, Penn & Teller. Then Autodesk’s chief technology officer, Jeff Kowalski, used the “big stage” to recommend “looking outside” your traditional boundaries to find the new and key ideas needed to move forward whatever you are working on. Kowalski noted that in such a large and diverse world, there are going to be many great ideas out there (many better than yours), so if you rely only on the ideas proposed inside your own walls and teams, innovation is inherently less than what it could be. The ideas are out there, and modern mobile/social/cloud technology is making it a lot easier to find them. 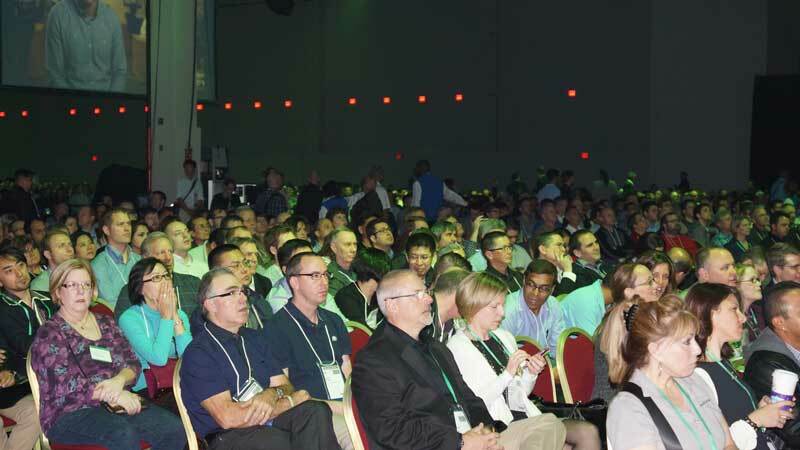 Thousands turned out for the opening keynote address at Autodesk University. Next onstage was Autodesk CEO Carl Bass, who, after showing off his new guitar made from Autodesk-enabled machining tools, went through many of the products and customer stories that would be highlighted throughout the week. He was also the first of many this week to use the “it’s the Facebook for …” metaphor for how products help users collaborate with others in familiar ways. My next stop was “Media Day,” an annual gathering of the scores of media in attendance. We were presented with innovations from many of the Autodesk products, often including the nearly ubiquitous “360” moniker, such as Autodesk Fusion 360, InfraWorks 360, BIM 360, SIM 360 and others. Visit the Autodesk Web site for a complete rundown, but the “360” moniker refers to a similar Web/Cloud-based platform that has been added to many products. The Media Day event allowed hundreds of press members to have their questions answered. Users log into their 360 platform and can look at and change models or whatever they are working on, collaborate with other approved users, and have information automatically updated so it’s always current and live. Bass and Kowalski then arrived for a question and answer session with the media, and they discussed some of the existing hurdles for online collaboration. One is hesitance to “open your ideas to outsiders,” and another is Internet bandwidth in large portions of the world. 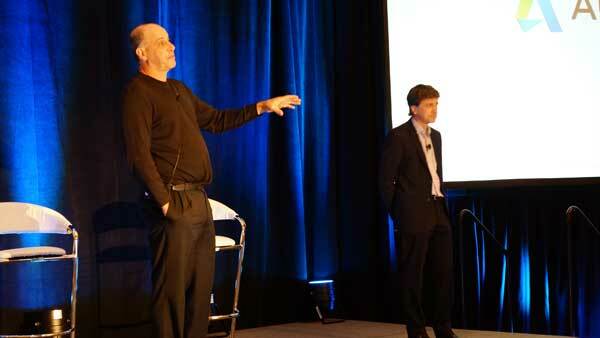 Autodesk CEO Carl Bass, left, and Chief Technology Officer Jeff Kowalski visited the Media Day gathering to answer questions. Bass noted that “there are areas where ‘willingness to collaborate’ is not as readily adopted,” and these often are in larger, more-established companies. However, he added that “in smaller companies, they’ll adopt cloud-based, connected environments first to gain advantage,” and the rest will follow. As for bandwidth, it’s a problem that will persist, but many areas are turning to cellular technology to fill the gap. Mobile apps that use cellular service are very popular in areas with poor Wi-Fi or hardline connectivity. At an Architecture/Engineering/Construction (AEC) Innovation seminar in a large ballroom, the audience heard from several presenters. One was Eddy Krygiel, an architect with HNTB, which is working on a massive project at Denver International Airport that has been collaborating with a startling amount of subcontractors. Not a scene of urban destruction, but a video game. SimCity uses such realistic city models that almost anything is possible. My other favorite presentation was from Stone Librande, creative director at Maxis, Electronic Arts. 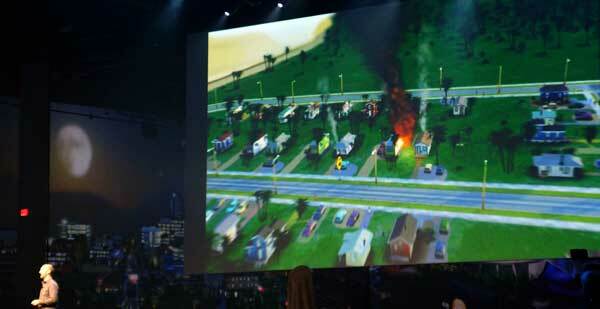 I’ve never played the company’s SimCity games, but the presentation looked amazing. It looks and feels like genuine “cities of the future” are being built from scratch. It will take some serious self-control to not get sucked into the game when I return home. On Dec. 4, the day started with a customer panel featuring a wide range of participants. No offense to the leaders of some large and successful companies, but everyone, participants included, wanted to hear most from Stephen Ambrose of Asius Technology. What the company does now is interesting, creating earbud-like inserts that prevent hearing damage, but it was the stories of how Ambrose got to this point that had everyone’s attention. For decades, he toured with Fleetwood Mac, Guns N Roses and other major musicians, helping them have a better experience with less hearing loss (although too late in some cases …). The next “cool thing” was a seminar called BuildX, which highlighted ideas that could be the future of construction. Presenters noted that “reality capture” (e.g., laser scanning, ground-penetrating radar, etc.) is becoming cheap enough and easy enough to use to record real, current data many times during construction to track progress and catch mistakes before it’s “too late” or very expensive to fix. 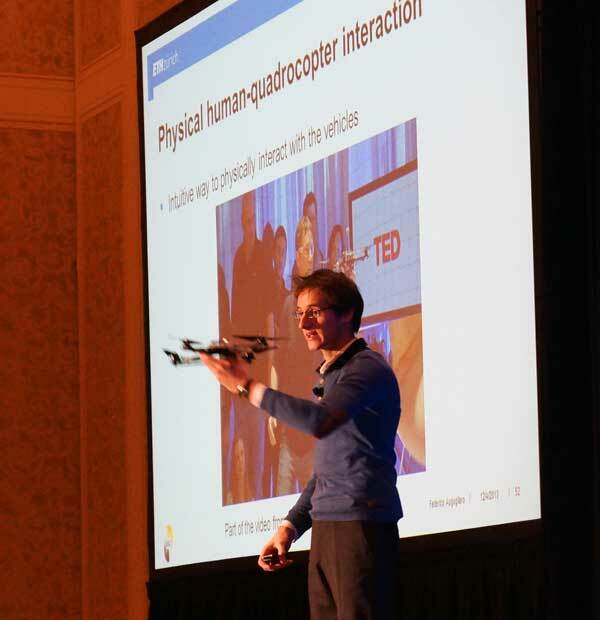 Quadrocopters were one of the futuristic technologies featured at BuildX. The future really is now. There also was a demonstration of “quadrocopters,” which are small helicopter drones similar to those recently announced by Amazon as a futuristic product that’s arriving sooner than anticipated. In addition to “cool tricks” like playing ping pong with each other and reacting to the location of other drones, they can be used for “light construction” within size and power limitations. 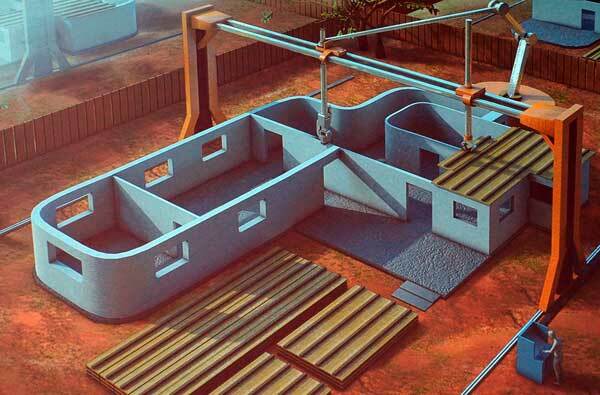 Using Contour Crafting, affordable homes can be built within hours. An impressive presentation also was delivered by Behrokh Khoshnevis, who created the concept of “Contour Crafting,” which is like 3-D printing on very large scales using concrete as the building material. Machines can be programmed to build affordable homes in less than a day (a 2,500-square foot building in less than 20 hours), possibly changing the future of slums and other areas where traditional homes can’t or won’t be built. His group also is experimenting with the idea of building on Mars, using only Martian materials. The possibilities are countless. To cap off my final day, I went on a field trip into Las Vegas that was hosted by VTN Consulting. Due to the technology and outside temperatures, everyone on the trip described it all as “very cool.” I was there performing some film work, so you’ll soon be able to watch that video on GeoSpatial Stream, and see the exciting details and technology that pleased those in attendance. There you have it—my first experience at Autodesk University. I learned a lot about the company’s wide variety of products and the range of their uses. And, as suggested in the opening keynote, I definitely stepped out of my comfort zone and was introduced to new ideas in industries that I’ve never covered to this point. 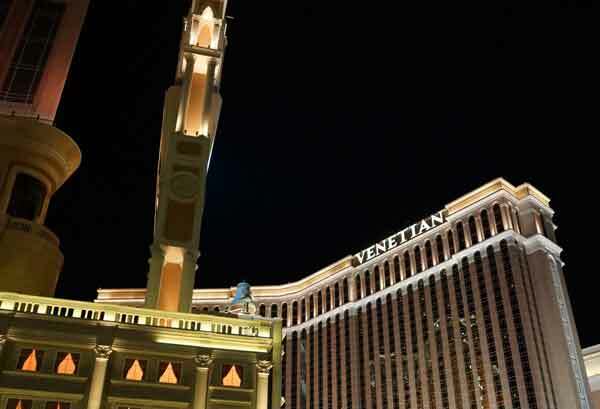 The Venetian hotel and casino is a beautiful venue along the Vegas Strip. And did I mention that it was at The Venetian in Las Vegas? There was much to like and learn from, and I look forward to attending again in 2014.